First, it is NOT a scam or phishing ploy. 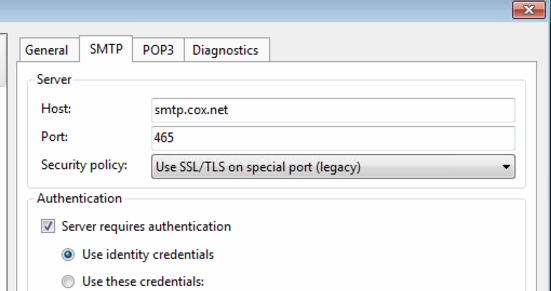 Cox will be making some necessary and important changes to security on their servers for their customers. 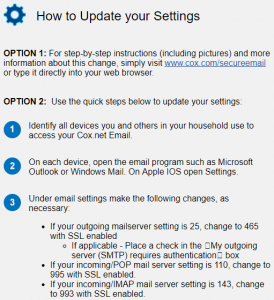 These changes require that their customer’s email application settings are correct so that Cox customers can still access their email servers. So how can the average user be confident that it is not a scam? 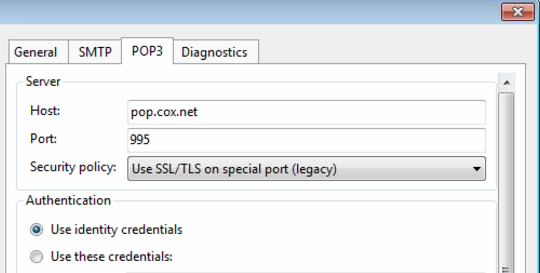 You can look at the email heading and see that it is indeed from a cox.com address and that it is addressed to you, however, it is possible for the address to be spoofed to make it look like it is from someone it is not so the heading alone is not enough. The main thing you should consider is the action required in the email. What are they asking you to do? Are they asking you to click on a link, login somewhere using your account user name and password, provide them with sensitive information such as a credit card number or download a file? So far they have simply provided and explanation and information. The rest of the email gives you the information that you need to apply the changes. They do provide a link that you can click on, but they also suggest that you can “type it directly into your web browser” which is the safer way to handle it. You can be confident that it is safe to type www.cox.com/ into your web browser because that is Cox’s website. You should always pay attention to what is right before the .com, .org, .gov, .biz etc. For example www.cox.com/secureemail is safe, “www.cox.secureemail.com” is NOT or at least, it is NOT a Cox website — “www.cox.secureemail.com” would be an address for a website called “secureemail.com” which may or may not be a legitimate website. This difference is perhaps one of the most important things you can understand about website addresses and staying safe online. It should be noted that misspelled web addresses are also a common ploy of criminals – for example, fake: amozon.com versus legitimate: amazon.com. 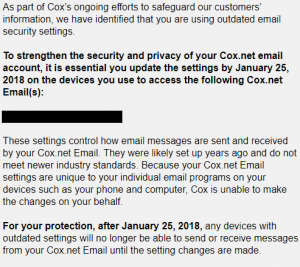 Continuing to analyze the Cox email, we see that they also provide steps for you to do which do not involve clicking on anything or providing any sensitive information like your email password. They are simply giving you the proper settings for YOUR email program that you use to read your email. Scams or malware bait usually involve an urgent request for you to provide sensitive information or click on something that is going to get you into trouble without giving you other options. If you are in doubt about an email it is still better to be cautious and call the customer service number for the company involved. There is certainly no harm is checking first, but I wanted to provide a few tips to help you evaluate questionable emails. Now, to address how you make these necessary changes to your email program. Cox provides very good information on their website for the most common applications that people use. I will link to those below. Not everyone uses the email applications they support in the information they provide, so I will include some screen shots of the settings for users of emClient, another common email application. Even if you don’t use one of the applications Cox or I have addressed, the setting information changes are the same. 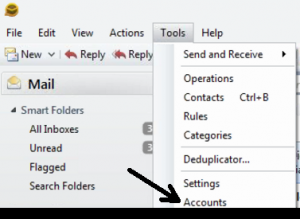 They key is to find the Accounts section in the settings of your chosen email application. Below, I hope that I have provided the information you need to make these changes to your Cox settings, but if you need assistance please contact The Computer Monkey. These settings can be adjusted in a matter of minutes via a remote connection.